BCEC’s commitment to innovation and uncompromised quality and consistency of its Food & Beverage was celebrated at the prestigious national awards when it was judged best in Australia for Banqueting & Catering. 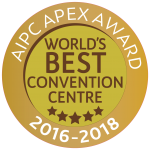 This latest achievement comes at a time when BCEC’s Food & Beverage product has also been recognised as the ‘World’s Best,’ in a global client based survey part of the AIPC World’s Best Convention Centre Award presented in Nantes, France. BCEC General Manager, Bob O’Keeffe said Food & Beverage was fundamental to the Centre’s operational reputation and to be recognised at the very top level of the industry was an honour and a credit to all those involved. “We are committed to a path of innovation and creation with a strong customer experience focus ensuring we continue to deliver a world class product.” Mr O’Keeffe said the recent establishment of the only dedicated Dietary Kitchen in an Australian Convention Centre and the introduction of a stand-alone healthy option banqueting menu were successful examples of this. Mr O’Keeffe congratulated Meetings & Events Australia on a successful conference and awards presentation and said he looked forward to welcoming the MEA Annual Conference to Brisbane and the Centre in 2019.